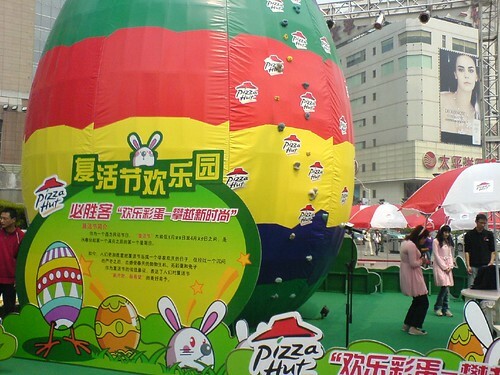 So what does Easter mean in Shanghai? 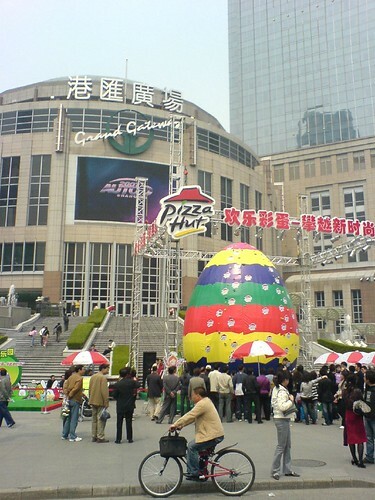 An outdoor Pizza Hut promotion in Xujiahui! I didn’t stick around for the activity they were cooking up, but it looks like it is possibly inspired by the saga of Little Bunny Foo Foo? So what happens when you are nearly to the top of the rock challange and you fall off? There doesn’t seem to be any safety ropes and the astroturf looks like the landing would be painful to say the least. Like nearly all promotions in China, this one too looks ill conceived and amateurish. Everyone knows that after three days of being dead Jesus was STARVING for some pizza. That’s freaking hilarious. Walking in totally unsexy pink dresses but with pink bunny ears. Only China………. Where’s the love for Passover in China? Pizza Hut? McDonald’s? Dico’s ? Anybody? Siyan, don’t spam other blogs with your crap. You’ve already ruined SmSh with your narcissistic nonsense. Yeah, I had to edit the comment she left on my ShExpat weblog. Annoying. I so wanted some Peeps for Easter, but of course I could not find them any where here. But someone is sending me an Easter basket full of them. My mouth is watering just thinking about them. Mmmmm. Heh. 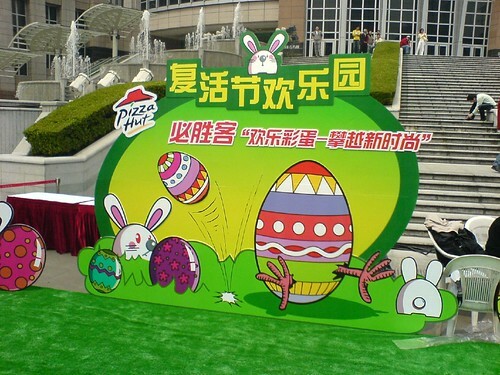 Seeing how Easter is the most pagan of all the Christian holidays, I think a Pizza Hut-endorsed, egg-climbing event assisted by somewhat homely girls in bunny ears is quite fitting.